the French Ninth Army during the opening days of the Blitzkrieg. The battles of France 1940 were an excellent mix of troops, nationalities, vehicles and equipment. From the intrepid horsed Spahi, to the massive B1 Bis tank, German and Belgium Engineers, regular to elite French forces. This all combines for fun and exciting skirmish miniatures play. and mixed infantry and vehicle battles. Play the heroic defense of La Horgne or De Gaulle's famous counter-attack at Montcornet. Additional scenarios deal with the intense fighting in the Ardennes forest, the daring river crossings at Monthermé and the final destruction of the Ninth Army. German forces will encounter French senior command units as headquarters and outposts are overrun. Optional forces allow for maximum replayability. for the Ninth Army and Sixth Panzer Division all enhance play and unit motives. The scenarios are ideal for 15mm to 28mm individually-based figures. 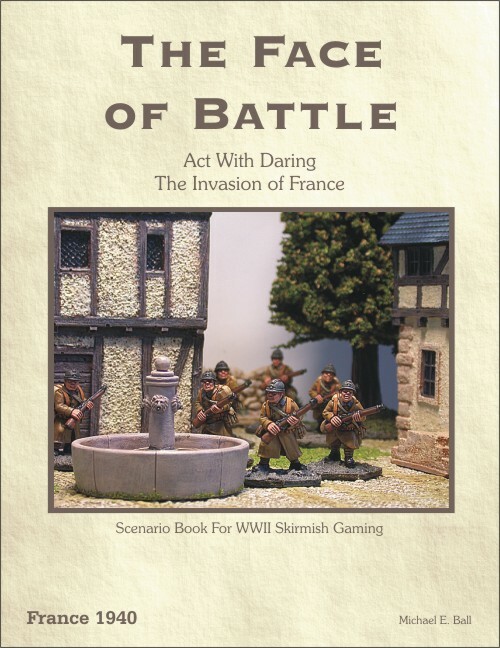 Act With Daring scenarios are usable with many gaming systems: Arc of Fire, Battleground WWII, Crossfire, Battalions in Crisis, Cross of Iron, Disposable Heroes and more.